While we were visitng my parents back home in FL last weekend, they took us to a really amazing dinner at a little place on Longboat Key called Euphemia Haye. It’s been around for 30ish years, so I don’t know how we’ve never been here with them before. The building itself looks like a historic home, and the inside is decorated with all sorts of old Broadway posters and tons of hanging plants covered in little white lights. The restaurant is broken up into smaller dining rooms, which makes it feel really quaint, and the views from the windows are of really pretty gardens surrounding the building. We started off with the Fried Green Tomato Fusion (panko and cornmeal-crusted green tomatoes, pan-fried and served with a spicy, roasted red bell pepper sweet chili sauce and topped with pecan pesto and feta cheese) and the Sweet & Spicy Shrimp (Jumbo Gulf shrimp, seasoned with Cajun dust, char-grilled, and served with a honey mustard sauce). I don’t eat shrimp, but the tomatoes were quite yummy. We also got the Nouveau Waldorf Salad, which I could have eaten over and over again. It included tons of pear slices, mixed greens, candied pecans and gorgonzola crumbles, and was drizzled with a red wine vinaigrette. The highlight of the meal, though, is what we came for — the Key West Snapper. My dad had this recently and has been raving about it ever since, so 3 of the 4 of us got it for dinner. 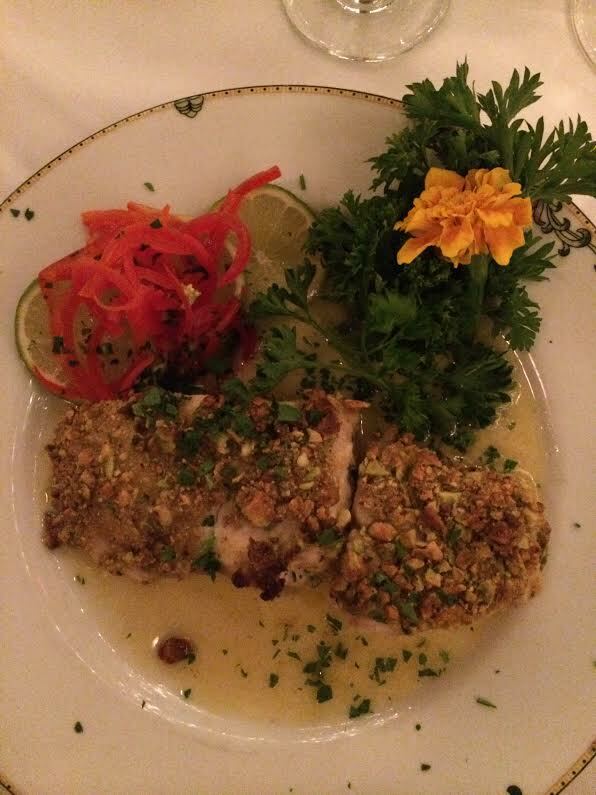 The dish was made up of fresh Gulf Snapper encrusted with seasoned pistachios, baked, and served with key lime-jalapeño beurre blanc and red pepper curls. To die for. While I like white fish, I don’t usually choose it over other menu items when dining out… but I’d eat this a million times over. The pistachio crust and the key lime sauce were just the most perfect combination. Next up…. a trip to the dessert room! The space is called the Haye Loft, and it caters to walk-in diners as well as those wanting after dinner drinks/desserts (you can order a small selection of desserts in the regular dining room, too). Dessert is one of my most favorite things ever, so I was pretty excited to get to choose from all of these options below. Although seeing about 12-15 of them lined up next to each other makes for a very hard decision. We of course each ordered one… Triple Berry Glaze Pie, Florida Key Lime Pie, Pecan Pie, and Apple Walnut Crumble Pie. Somehow, not a single chocolate dessert in the mix. Clearly, they were all terrible. If you’re in the Sarasota area anytime soon, you should definitely check out Euphemia Haye. It’s certainly going to be on my list to visit next time we’re home!